Coinflip: new Gambling low fees ETH dapp is coming, what to expect? Coinflip is a new dapp to revolutionize the gambling based on the blockchain. People from all over the world enjoy the rush of dopamine and excitement given from a big win in any game. With the arrival of the Blockchain and the expansion of the cryptocurrencies, many Decentralized Application (Dapps) started to appear, allowing the users to play from every part of the world, in any moment, with the guarantee that every rule is respected thanks to the smart contracts written in the blockchain visible to everyone. Many DApps have been created only to fill a void in the cryptospace. They are hard to use, with high fees, giving a small chance to win to their users. This is a small step of a big transiction from the old economy to what will become the new crypto standard. And it’s not enough. The advantages of the blockchain are not used yet and this seems just a tentative to bring in the crypto world something already successful in our society, taking advantages of the early stage just for profit. much more, allowing them to enjoy every game with the minimum fees and the maximum fun, expecting high percentage of win, like in standard games of our old society. in his life and it is often used in our days. 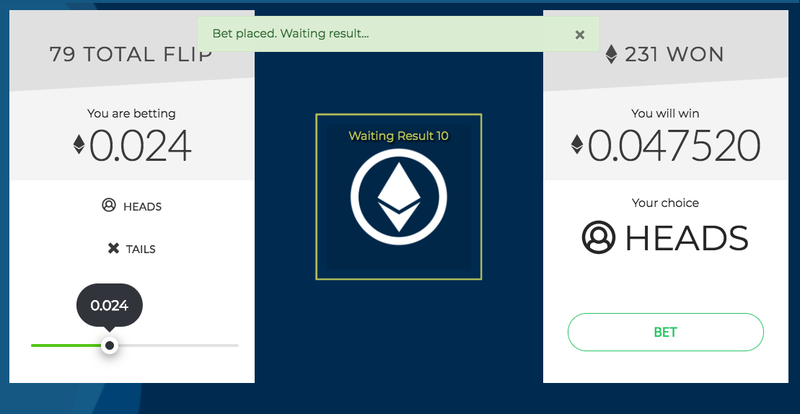 Our smart contract is executed, the bet is received and sent to the blockchain, as soon as the lucky side is calculated, the results will appear on our site, informing if the bet was a win or a lose. Every use of the blockchain has a cost. 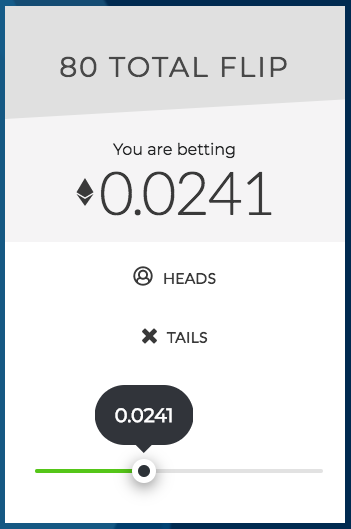 Compared to many other Gambling DApps we optimized the smart contract to use the minimum fees possible to communicate with the blockchain and interact with Oraclize allowing us to take as a fee less than 1% of the bet on average. The player has 50% chance of winning. 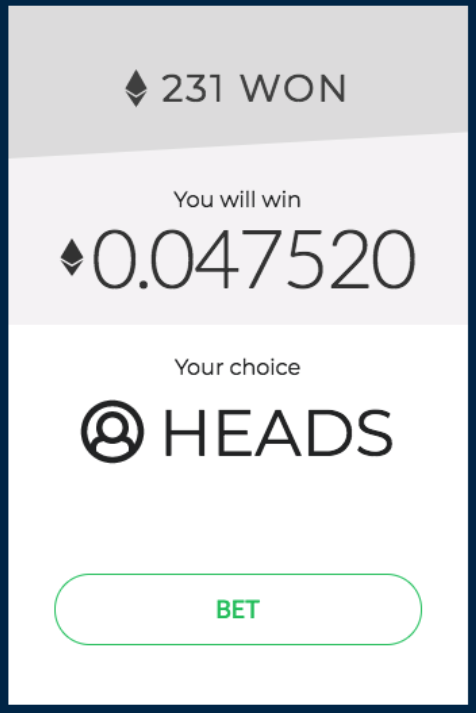 In the case the bet is lost, the amount goes in the smart contract and become available to win for other people. 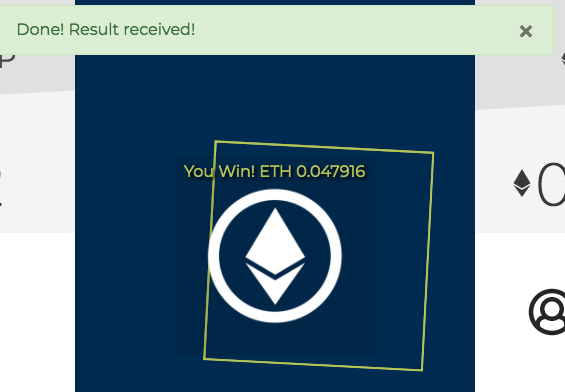 That means more player, more games, more ETH ready to be won. 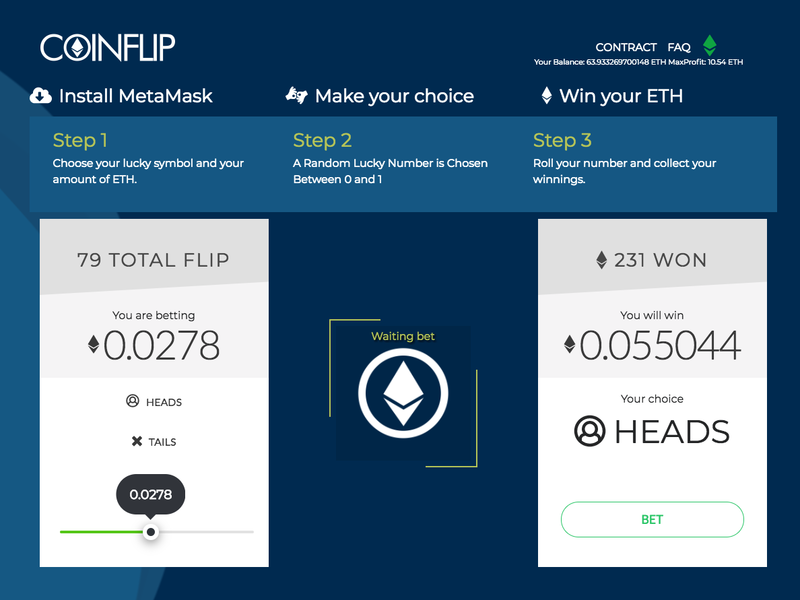 CoinFlip is a new ether gambling game with the best user interface ever built. We offer less than 1% fee to play and win in the most famous game, coinflip!